Facilitates interaction with Oracle via SQL*Plus. Moreover, this package complements Lisp:plsql.el (Kahlil Hodgson) upon convenient compilation of PL/SQL source files. in sqlplus-mode or plsql-mode you can easy go to the definition of database object name under point (table, view, synonym, index, trigger, package, function, procedure) in filesystem. M-. or C-mouse-1 find the definition of database object name under point in filesystem (use arrow button on toolbar to go back). Tested in Linux only for now, feedback from other sys users expected. Please use Emacs 22+. Explore pop-up menu options in right window after mouse-3 click. There is a bad interaction with require-final-newline when it is set to a value that means that the user is asked each time. When saving the output in HTML, for instance, there seems to be a hook loop that keeps asking if a final newline is to be appended. Setting the value of require-final-newline to t does not seem to trigger this bug. CONTEXT parameter is an alist with info about command executed (SQL text in particular). The DATA parameter is a list (COLUMN-INFOS ROWS MSG) if result is a table, or string in any other case. COLUMN-INFOS is a list of column descriptors (name of column etc. ), ROWS is a table of records (record is a list of strings), MSG is a message under the table (something like “28 rows selected.”). Hi. I’ve been using this for a few days and really like it. However, I’m experiencing some bugs with plsql.el. It throws a RegEx error when trying to format PL/SQL Functions, also it doesn’t capitalize keywords. Has anyone experienced this and/or found a fix? I’ve started using it yesterday (Emacs 23.1.94.1 of 2010-03-23, Windows XP). Right now I wonder how to load and save my foo@bar.sqp buffers into files and return to it next time. sqlplus mode is really good. 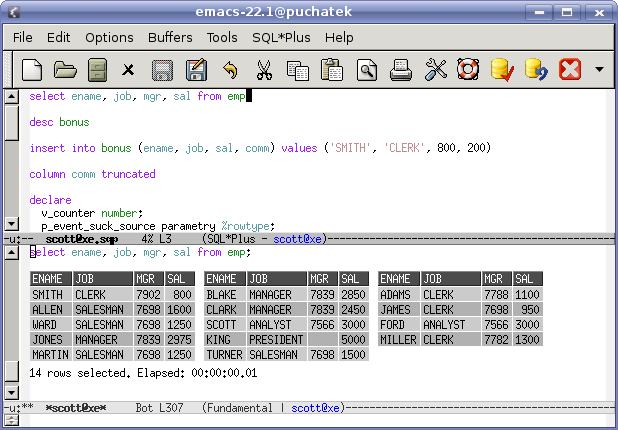 I no longer need sql developer to browse schemas - good old emacs can do it all ! Really quite impressive. I’ve tried it under Win32, you just need to customize sqlplus-command (set it to the full path of sqlplus.exe). Connection Manager for the Sqlplus Mode. "Build a connection string and make a connection. The point must be in an org-mode table. 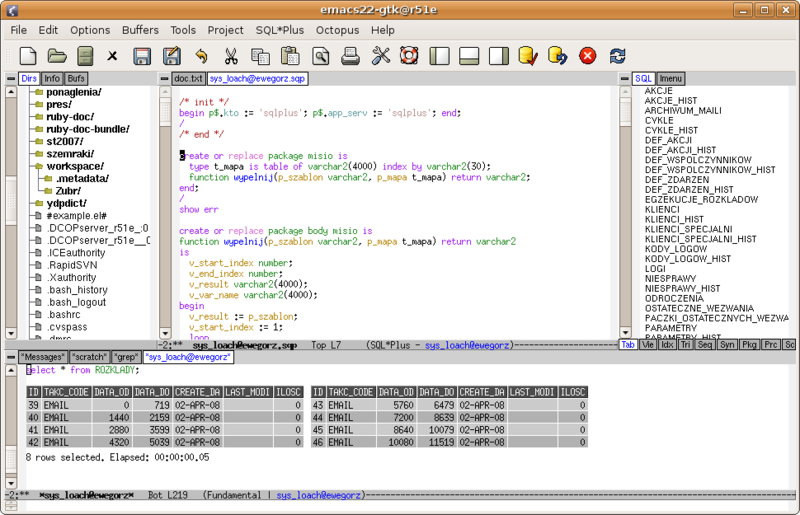 Columns of the table must correspond to the `sqlplus-x-columns' variable." Advice. Use EasyPG package to keep your connections table in secret. Something else: it’d be good to use the natural Comint shortcuts (C-c C-b to send buffer, C-c C-r to send region, etc.) as these are common to multiple modes (R buffer, etc. ).